Austal USA’s Expeditionary Fast Transport (EPF) team finalized the delivery of USNS Carson City (EPF 7) to the U.S. Navy during a small document-signing event held onboard the ship on June 24, 2016. The EPF program provides the Navy with a new high-speed intra-theater transport capability. The 338-foot long Carson City is an aluminum catamaran capable of transporting 600 tons, 1,200 nautical miles at an average speed of 35 knots, and is designed to operate in austere ports and waterways, providing added flexibility to U.S. warfighters worldwide. The ship's flight deck can also support flight operations for a wide variety of aircraft, including a CH-53 Super Stallion. The latest delivery marks the seventh EPF ship delivered to the Navy as part of a 10-ship, $1.6 billion block-buy contract. Upon delivery of USNS Carson City, three additional Spearhead-class EPFs are under construction at Austal’s Mobile, Ala. shipyard. Yuma (EPF 8) is being erected in final assembly and modules for City of Bismarck (EPF 9) and Burlington (EPF 10) are under construction in Austal’s module manufacturing facility. 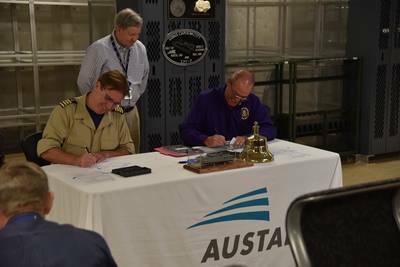 In addition to the EPF program, Austal is also under contract to build Independence-variant Littoral Combat Ships (LCS) for the U.S. Navy. Four LCS have been delivered, including the future USS Montgomery (LCS 8) which was delivered late last week, while an additional six are in various stages of construction.